Then, InLoox PM 7 Web App integrates the respective planning element according to this specification into the project planning. For more information on constraints, see Create planning element dependencies. For more information, see Create planning element dependencies. 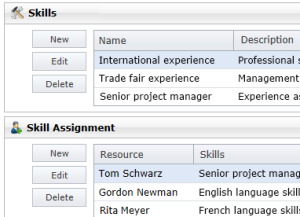 In version 7, you can use positive and negative time lags between planning elements in your project planning. So, you can easily depict overlaps in time of planning elements as well as lead and waiting times. For more information, see Create dependencies between planning elements. 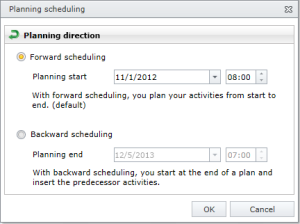 InLoox PM 7 Web App offers you both planning directions, forward scheduling and now, also, backward scheduling. Now you can decide whether you want to develop your project plan from your current starting point or based on the desired project results. For more information, see Backward scheduling. Enter the skills of your team members in the InLoox PM options. As soon as you have created the respective skills in the InLoox PM options and you have assigned them to one or several resources, you can search for the specific skills whenever you want to add a resource in the project. For more information about how to assign skills to resources, see Assign skills to resources. InLoox PM 7 Web App enables you to reverse entries or to restore cancelled entries. Click therefore in the planning on the Edit tab Undo to reverse the latest entry or click Redo to restore a reversed entry . In the InLoox PM options, you can now create individual working time calendars to integrate for example part-time, shift or weekend work. With several individual working time calendars, you can include different working times or holidays at different company sites. 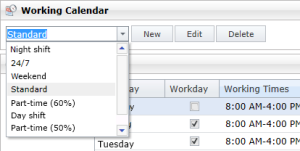 Then, you can assign different working time calendars to the different elements in the project planning. For more information, see Set a working time calendar. Now, you can highlight planning elements in the planning in user-defined colors, e.g. to mark departmental responsibilities or to highlight priorities. Select therefore a planning element from the planning and click Color in the Highlight group on the Edit tab. 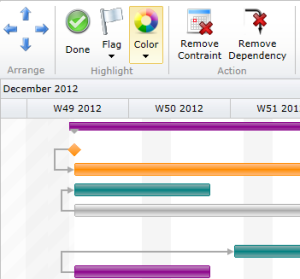 The planning element is then displayed in the selected color in the Gantt chart. For more information on how to customize the view of your planning, see Work with the planning. Filter and sort your project planning according to your individual information needs. These features help you to keep an overview, especially of extensive project plans. You find them in the planning on the View tab in the Arrange group. For more information on how you can display your planning filtered or sorted by specified criteria, see the Adjust a view section in the article Work with the planning. In InLoox PM 7 Web App, it is no longer necessary to open planning elements and to edit them in a dialog box - you can do this directly in-line. Click therefore in the planning in the line of the planning element that you want to adjust and change its name, start or end date. For more information on this topic, see Work with the planning. 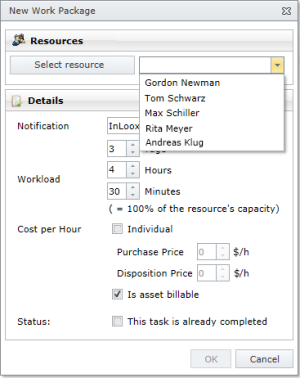 Now, you cannot only assign project resources in InLoox PM Web App via the Select Contact dialog, but also via quick selection, e.g. in the time tracking or the planning. Click the arrow to receive a compact pre-selection of often deployed resources. Please see the respective help categories to receive more information on this topic. Define the period of the notification in some day(s). For more information, about where to find the InLoox PM options, please see Open the InLoox PM options. Click Planning in the navigation pane and then click Notification Details. Below you see the Notifications Details area. Select the check box Enable prenotificationto define in how many days the notification will be sent. this feature is valid only for the actvie projects. the project schould not be archived or has a progress of 100%. the planning element in the notification should not be done or has a progress of 100%. New planning features in InLoox Web App 7 • Copyright 1999-2019 © InLoox GmbH. Tous droits réservés.